Dr. Toretsky talks about his research on Ewing's sarcoma. Funded by the Initiative, this research study led to the discovery and subsequent publication of the first small molecule targeted to EWS-FLI1. Funded by the Initiative, this research study led to new discoveries about Ewing's sarcoma. Dr. Loeb explains the use and potential of targeted therapies in the treatment of sarcomas. Drs. Mercado and Barr discuss chromosomal translocations, fusion proteins and molecular therapeutics. Current therapy for Ewing's Sarcoma Family of Tumors (ESFT) combines high-dose chemotherapy for systemic control of disease, with surgical and/or radiation therapeutic approaches for localized tumor control. Despite this multimodal treatment strategy the cure rate for localized disease is only 70%, and the cure rate for patients showing metastatic disease at presentation is less than 30%. Many new pharmaceutical agents have been tested in early phases of clinical trials in ESFT patients who have recurrent disease. While some agents led to partial response or stable disease, the percentage of drugs eliciting responses or causing an overall effect have been minimal. The most promising new chemotherapeutics resulting from phase II clinical trials, seem to be topotecan and its derivative irinotecan.1-3 During the last couple of years, small numbers of ESFT patients have been treated with docetaxel,4 gemcitabin,5 bortezomib6 or ecteinascidin-7437 in phase I and II trials with no significant improvement to disease cure or stabilization. Furthermore, of the new pharmaceuticals being introduced to clinical practice, the most effective agents also have dose-limiting toxicities. Novel approaches to minimize non-specific toxicity are needed both for patients with recurrence and at diagnosis. Click the Image to see Figures 1-3. Then use the arrows to navigate. 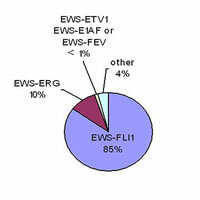 Typically, ESFT contains a cytogenetic abnormality-a chromosomal translocation between the EWS gene (chromosome 22) and one of the genes FLI1, ERG, ETV1 or FEV. In the vast majority of cases this leads to the expression of the EWS-FLI1 (EF) chimeric fusion protein (see Figures 1-3). EF expression is necessary for tumorigenesis in ESFT cells8 and elimination of EF in laboratory models leads to ESFT cell death.9-11 While ESFT cells appear to require EF for growth the non-rearranged EWS gene seems dispensable.12 EF is not expressed in any cells except those of ESFT. Therefore, EF targeting would, in theory, only affect ESFT cells. Despite this specific tumor target there is no treatment available that directly targets EF. However, ESFT research in recent years has been characterized by the development of some encouraging new strategies that reduce the expression or function of EF. Some of the most promising approaches are going to be discussed in the following paragraphs. The most direct specific approach to inactivate EF is based on short nucleotide sequences (called oligonucleotides) which can pair with the single stranded mRNA molecule which codes for the EF protein sequence. These oligonucleotides hybridize to specifically selected sequences and thereby halt protein translation and mRNA splicing. Subsequently, EF protein levels are significantly reduced. There are two slightly different biological methods to achieve this goal. a. Antisense technology: Antisense oligonucleotides are short, synthetic single stranded DNA molecules that are complimentary, or antisense, to a specific target sequence on the RNA. Hybridization of these antisense oligonucleotides to their target sequence in the cells results in degradation of the mRNA, thereby preventing the generation of a functional protein. In laboratory cell line models antisense oligonucleotides are easy to administer. In general they need to be chemically modified to block their degradation. Cumulative clinical and preclinical data suggest that antisense technology has the potential to result in new treatment strategies for a variety of diseases. The first antisense drug (Viltravene™ from Isis/Novartis) recently received FDA approval for treatment of cytomegalovirus (CMV) retinitis in AIDS patients. This treatment is largely successful because the drug is administered by injection directly into the eye, a procedure not readily translatable to ESFT patients. b. siRNA: The second mechanism used to block RNA translation is called siRNA (inhibitory RNAs) which are short double stranded RNAs of approximately 19-21 base pairs in length. Similar to antisense oligonucleotides their sequence is specifically selected to match a particular target sequence (e.g. EF). To efficiently pair one strand of these inhibitory RNAs to the transcript and to subsequently destroy the transcript, a different set of enzymes (dicers) must be activated. For several reasons inhibitory oligonucleotides never yield a complete absence of the targeted protein. In addition, while these strategies are being actively investigated, their delivery to human tumors currently proposes a technical challenge. Therefore antisense/siRNA strategies may not provide an additional benefit at this time, but suggest promise in the future. Antibodies are protein molecules that the immune system uses to target so called antigens. Antibodies can be directed to extracellular surface antigens and also to intracellular antigens. For the intracellular application they have to be delivered by similar methods as inhibitory oligonucleotides, which allow them to penetrate the cell membrane. This alternative approach to inhibitory oligonucleotides employs specific recombinant antibodies (so called single chain antibodies) to inhibit EF function. Their key advantage is the ability to genetically engineer those antibodies in a way that intracellularly directs them to the target proteins place of action. It was recently reported, that recombinant antibody technology was used to successfully interfere with wild type EWS protein.13 Unfortunately the described antibody does not have any impact on the EF chimeric protein. This may, in part, be a result of the originally performed screening strategy and the difficulty in obtaining structurally unaltered and functionally active native EF. However, single-chain antibodies are a theoretically promising strategy, worthy of further investigation. ESFT uses critical signaling surface proteins that might result in antibody-targeted therapy. The IGF pathway14 has been inhibited with antibodies and in combination with chemotherapy might lead to therapeutic advances. IGF-IR antibodies are also undergoing current clinical development and are likely to be tested in upcoming ESFT trials. ESFT express the CD99 antigen on their external cell membrane, but the function of CD99 is cryptic. Antibodies directed towards the ESFT surface marker CD99, along with doxorubicin based chemotherapy15 achieved a delay in tumor growth and improved survival in animal models. Inhibiting the EF protein function is the main goal of our laboratory. Transcription factors, like EF, function in a large multiprotein transcriptional complex. Therefore, EF, like other transcription factors relies on direct protein-protein interaction. We recently discovered EF interacts with RNA helicase A (RHA), an RNA/DNA unwinding enzyme involved in many basic cellular functions like replication, transcription and translation.16 Our work studying the interaction of RHA with EF suggests that RHA is necessary for EF tumorigenic function. We have begun to develop strategies to prevent RHA from interacting with EF as a mechanism to inhibit the growth of ESFT. One possible way to disrupt this binding is to use a short protein sequence (called a peptide) that mimics the specific RHA region that binds to EF. This peptide competes with the wild type RHA for the binding site on EF, thereby inactivating the functional transcription complex. Our current research is directed towards interrupting the interaction between EF and its protein partners with small molecules specifically designed to mimic certain functionally active protein domains. Like a peptide mimic, these drugs would keep EF apart from its interacting proteins. The small molecules can be modified to have properties that would allow them to become clinically useful pharmaceuticals, including avoiding degradation in the serum and penetrating the cell membrane. The EWS-FLI1 protein in ESFTs is a potential therapeutic target that is critical for ESFT survival and only present in ESFT cells. The challenge is how to harness this unique target and create specific therapies. Knowledge of how EF functions continues to accrue and this knowledge will lead to novel ways that specifically and effectively treat patients. The parallel increase in technology, such as delivery systems, will likewise benefit future patients. Patients with ESFT will benefit from ongoing investigations that will hopefully allow for more successful and less toxic therapies. 1. Saylors, R. L., III, Stine, K. C., Sullivan, J., Kepner, J. L., Wall, D. A., Bernstein, M. L., et al. Cyclophosphamide Plus Topotecan in Children With Recurrent or Refractory Solid Tumors: A Pediatric Oncology Group Phase II Study. J Clin Oncol. 2001;19:3463-3469. 2. Andrea Hunold, N. W., Michael Paulussen, Andreas Ranft, Caren Liebscher, Herbert Jürgens. Topotecan and cyclophosphamide in patients with refractory or relapsed Ewing tumors. Pediatric Blood & Cancer. 2006;47:795-800. 3. Gianni Bisogno, R. R., Antonio Ruggiero, Giampaolo Arcamone, Arcangelo Prete, Gianmarco Surico, Massimo Provenzi, Patrizia Bertolini, Paolo Paolucci, Modesto Carli. Phase II study of a protracted irinotecan schedule in children with refractory or recurrent soft tissue sarcoma. Cancer. 2006;106:703-707. 4. Ted Zwerdling, M. K., Philip Monteleone, Rebecca Byrd, Judith Sato, Rose Dunaway, Nita Seibel, Zhengjia Chen, John Strain, Gregory Reaman. Phase II investigation of docetaxel in pediatric patients with recurrent solid tumors. Cancer. 2006;106:1821-1828. 5. Wagner-Bohn, A., Paulussen, M., Vieira Pinheiro, J. P., Gerss, J., Stoffregen, C. & Boos, J. Phase II study of gemcitabine in children with solid tumors of mesenchymal and embryonic origin. Anticancer Drugs. 2006;17:859-64. 6. Robert G. Maki, A. S. K., Kelly Scheu, Jennifer Yamada, Scott Wadler, Cristina R. Antonescu, John J. Wright, Gary K. Schwartz. A multicenter Phase II study of bortezomib in recurrent or metastatic sarcomas. Cancer. 2005;103:1431-1438. 7. Lau, L., Supko, J. G., Blaney, S., Hershon, L., Seibel, N., Krailo, M., et al. A Phase I and Pharmacokinetic Study of Ecteinascidin-743 (Yondelis) in Children with Refractory Solid Tumors. A Children's Oncology Group Study. Clin Cancer Res. 2005;11:672-677. 8. May, W. A., Gishizky, M. L., Lessnick, S. L., Lunsford, L. B., Lewis, B. C., Delattre, O., et al. Ewing sarcoma 11;22 translocation produces a chimeric transcription factor that requires the DNA-binding domain encoded by FLI1 for transformation. Proc Natl Acad Sci U S A. 1993;90:5752-6. 9. Hu-Lieskovan, S., Heidel, J. D., Bartlett, D. W., Davis, M. E. & Triche, T. J. Sequence-specific knockdown of EWS-FLI1 by targeted, nonviral delivery of small interfering RNA inhibits tumor growth in a murine model of metastatic Ewing's sarcoma. Cancer Res. 2005;65:8984-92. 10. Tanaka, K., Iwakuma, T., Harimaya, K., Sato, H. & Iwamoto, Y. EWS-Fli1 antisense oligodeoxynucleotide inhibits proliferation of human Ewing's sarcoma and primitive neuroectodermal tumor cells. J Clin Invest. 1997;99:239-47. 11. Toretsky, J. 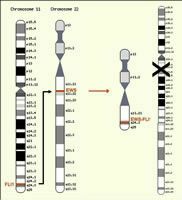 A., Connell, Y., Neckers, L. & Bhat, N. K. Inhibition of EWS-FLI-1 fusion protein with antisense oligodeoxynucleotides. J Neurooncol. 1997;31:9-16. 12. Kovar, H., Jug, G., Hattinger, C., Spahn, L., Aryee, D. N., Ambros, P. F., et al. The EWS protein is dispensable for Ewing tumor growth. Cancer Res. 2001;61:5992-7. 13. Aryee, D. N. T., Kreppel, M., Bachmaier, R., Uren, A., Muehlbacher, K., Wagner, S., et al. Single-chain Antibodies to the EWS NH2 Terminus Structurally Discriminate between Intact and Chimeric EWS in Ewing's Sarcoma and Interfere with the Transcriptional Activity of EWS In vivo. Cancer Res. 2006;66:9862-9869. 14. Scotlandi, K., Benini, S., Nanni, P., Lollini, P.-L., Nicoletti, G., Landuzzi, L., et al. Blockage of Insulin-like Growth Factor-I Receptor Inhibits the Growth of Ewing's Sarcoma in Athymic Mice. Cancer Res. 1998;58:4127-4131. 15. Scotlandi, K., Perdichizzi, S., Bernard, G., Nicoletti, G., Nanni, P., Lollini, P.-L., et al. Targeting CD99 in association with doxorubicin: An effective combined treatment for Ewing's sarcoma. European Journal of Cancer. 2006;42:91-96. 16. Toretsky, J. A., Erkizan, V., Levenson, A., Abaan, O. D., Parvin, J. D., Cripe, T. P., et al. Oncoprotein EWS-FLI1 Activity Is Enhanced by RNA Helicase A. Cancer Res. 2006;66:5574-5581. 17. Jia, S. F., Duan, X., Worth, L. L., Guan, H. & Kleinerman, E. S. Intratumor murine interleukin-12 gene therapy suppressed the growth of local and distant Ewing's sarcoma. Cancer Gene Ther. 2006;13:948-957. 18. Ramzi Dagher, L. M. L., Elizabeth J. Read, Susan F. Leitman, Charles S. Carter, Maria Tsokos, Theresa J. Goletz, Nilo Avila, Jay A. Berzofsky, Lee J. Helman, Crystal L. Mackall. Pilot trial of tumor-specific peptide vaccination and continuous infusion interleukin-2 in patients with recurrent Ewing sarcoma and alveolar rhabdomyosarcoma: An inter-institute NIH study. Medical and Pediatric Oncology. 2002;38:158-164. V4N3 ESUN. Copyright © 2007 Liddy Shriver Sarcoma Initiative. Distribution of ESFT cases related to their fusion proteins. The predominant fraction of ESFT are caused by EWS-FLI1 translocations. Schematic view of the ESFT specific translocation t(11;22)(q24;q12). Chromosome images derive from the Ensembl Project. The red bars indicate the untranslocated chromosomes on the left and the locations of the breakpoints. The red bar on the right shows the location where the EWS-FLI1 is transcribed. The black X shows the translocation result on chromosome 11, which is not transcribed to any protein product. 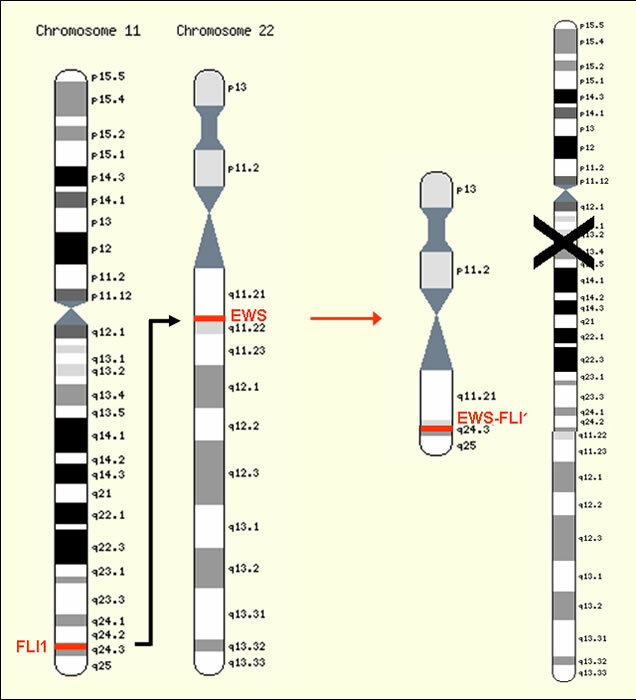 The chromosomal translocation between chromosome 22 and chromosome 11 leads to a fusion of the genes for EWS and FLI1, resulting in EWS-FLI1 protein with aberrant functions in comparison to the original wild type proteins EWS and FLI1.